मुद्राis mudrā, literally means a “seal” in Sanskrit. A mudrā is a symbolic gesture in Hinduism, Taoism and Buddhism, and a spiritual and energetic seal in the spiritual practice of East Asian religions. Some mudrās involve the entire body, but most are shown with hands and fingers. In yoga, mudras are helpful in meditation and pranayama to stimulate different parts of the body and affect the flow of prana in the body. Mudras are also used in classical Indian dance and martial arts. 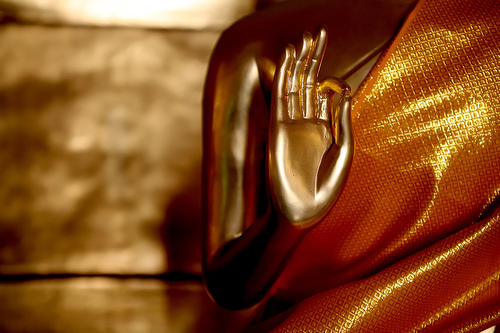 Mudras can affect energy in our body, and connect mind and body. The earliest mudras are found in Mantra Shastra (book of incantations), Upasana Shastra (book of worship and prayers) and the Nritya Shastra (book of classical dances). The Babylonian sun God Damuzi held a gesture as he descended into the underworld, and the mystical whirling dervishes of Islam use hand signs for various rites and rituals. In the West, cheironomy is the science of hand gestures (mudras), and in Christian art Jesus, John the Baptist and Virgin Mary use gestures. Roman art and Egyptian hieroglyphics also show many mudras, including kings and queens as mummies holding mudras into the afterlife. 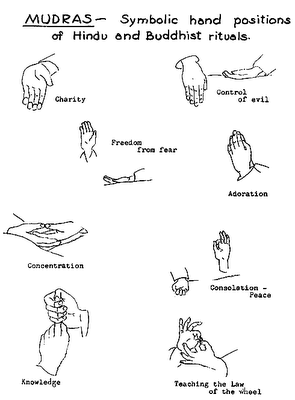 The fingers also correspond to the Five Elements, as well as emotions and the major organs. Thumb represents Earth, the stomach and the emotions of Worry and Meditation. The middle finger is Fire, the heart, small intestine, circulatory and respiratory systems, and the emotions of Joy and Mani. The ring finger is the element wood, liver, gall bladder, nervous system and the emotion of anger. The little finger is the element water, the kidneys and fear. Mudras can be practiced seated, standing, lying down or walking. The body needs to be loose, relaxed and cantered to connect with the flow of energy. When fingers touch, use a light pressure with hands relaxed. Just exert a bit of pressure to feel the energy of your hands. 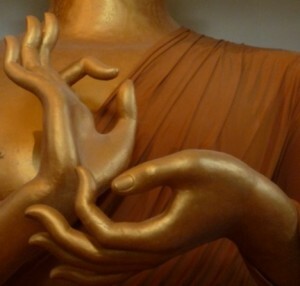 I have another post about some of the meanings of Mudras, so stay tuned. It will be a review of some common Buddhist and Hindu mudras and how they might be helpful in your yoga and meditation practice.